Today, good credit is the key to buying a home or a car, getting a job, taking a vacation, or just about any consumer purchase. A bad credit report or low score can make it hard to live, hard to work, and difficult to function. Collection agencies may harass you if your score is low. At Paulson & Nace, PLLC, our lawyers protect clients whose lives are damaged when their credit score is inaccurate. We use the FRCA to make sure credit reports have the right information because one negative item on your report can last for years. We file consumer privacy actions to make sure all the information on the credit reports is accurate and current. We also hold those entities that supply the wrong data to the consumer credit agencies accountable. This is a law that regulates the credit reporting agencies and credit bureaus to make sure all the information on each report is accurate, protects the consumer’s privacy, and is also fair. The FRCA states who can access your report and what information can be reported. It also states how long the information can stay on your report and your rights to dispute information on the report. If you are applying for a job, an employer may request a credit report. Landlords and lenders can also access your report to decide if they are going to rent to you or give you a loan. Confusing you with another person, such as someone with a comparable name or a similar social security number. Not following normal debt dispute procedures. Failing to remove information that cannot be verified or is inaccurate within 30 days of a dispute notice. Consumers should review their credit reports at least once a year. If you discover information that is not correct, you should notify the credit reporting agencies and dispute the information, or request that it be corrected. If you think your credit report is wrong or that you have been harmed by inaccurate information in your credit report, please call Paulson & Nace today. Our lawyers review your credit situation and your credit reports. We’ll explain the FRCA and work to get the information on your report corrected. 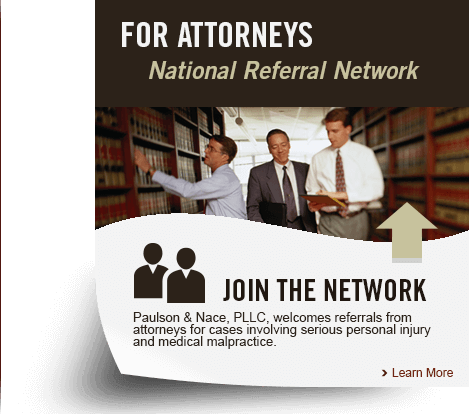 Paulson & Nace also reviews your report and the FRCA with you. In cases of willful violations, our lawyers sue for actual damages plus statutory damages. Actual damages are a financial loss you can prove was caused by the false report. Statutory damages include payments of between $100 and $1,000. Punitive damages and legal fees may also be awarded. Our lawyers may also sue for negligent violations, and we explain the danger of filing a frivolous lawsuit.